H+R have been invited to appear on TV again courtesy this time of Sam the Rothound. Filming took place at Glasgow School of Art. The transmission date will be in the next couple of months as part of The One Show programme on BBC one. 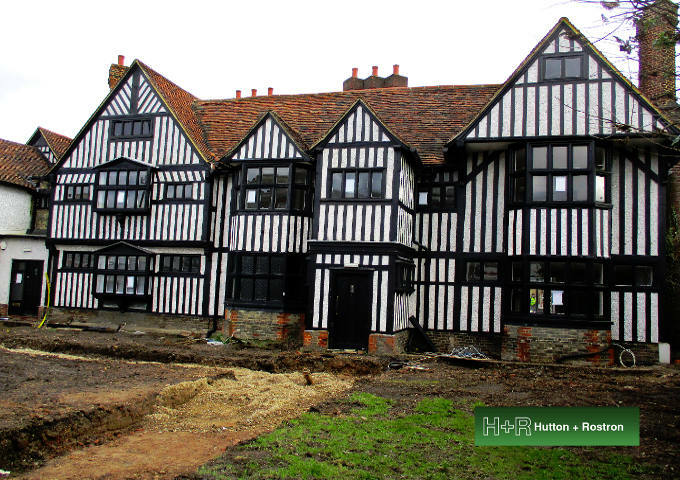 Furthering H+R connections with London Boroughs, H+R undertook a series of specialist surveys covering ground and surface drainage, condensation risk analysis, retained moisture management and timber condition at the oldest building in Southall which is the fine Tudor Southall Manor in the High Street. H+R also undertook dilapidation surveys at Clarence House in Brighton and provided a raft of investigations on a refurbishment and conversion project at Ravensbourne House in Kent. As well as historic buildings, H+R are regularly instructed to investigate building defects that have become apparent on new build projects. In February, specialist consultancy was provided on failure to engineered oak floor boarding and also decay to cross laminated timber on separate apartment block schemes in London. One of the H+R North West team was astounded to find an ‘inland sea’ of accumulated water on the flat roof of a Victorian mill building in Manchester to a depth of 6 inches. It was apparently akin to an infinity pool and covered a quarter of an acre. The imposed load must been very significant.